TADESSE GIRMAY is a young and promising architect based in Addis Ababa, as well as the contact person for SCECH in Ethiopia. 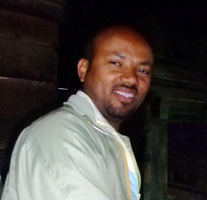 He has a BSc degree in architecture and urban planning and a MA degree in Archaeology at Addis Ababa University, where he 2009 presented his MA thesis: A Study on the Conservation of the Monastery of Gunda Gundo (Eastern Tigrai). His is a member of Association of Ethiopian Architects (AEA) and of Ethiopian Archaeologists Association (EAA). He has improve the status from being a trainee to researcher in Architectural Heritages and Lecturer at the Ethiopian Institute of Architecture, Building construction and City development (EiABC), an autonomous institute under the umbrella of Addis Ababa University. His key qualifications are architectural design, preparation of working drawings and construction supervision. He is also a proficient user of various CAD software, used in order to create 3D and axonometric architectural drawings. He is devoted to the issue of the cultural heritage of his country and wish to dedicate his future activity as an architect to building conservation in Ethiopia. Keeping with this he will be one of our first trainees in conservation. He would like to write a PhD thesis on building conservation, probably with focus on the church and the royal palace of Yemrehanne Krestos, and SCECH is now since sometimes investigating the possibilities to help him to make this plan come true at a Swedish University.